How are we to explain the 2016 AFL grand final win? The seventh-placed Western Bulldogs have defeated the minor premiers, Sydney, by 22 points. All of these, and more, will be under the microscope and certainly, all have played their part, but even the commentators recognise there’s also something more mystical at play in this ‘miraculous, fairy-tale’ win, the ‘dream-come-true’. 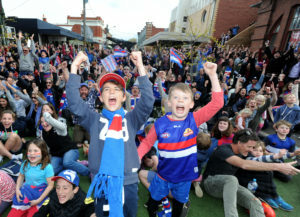 The Western Bulldogs have a strong band of loyal, faithful supporters who have wished and willed and sighed and prayed for this win. This year, and especially during this last month of finals games, those supporters have been joined by countless others: well-wishers, dreamers, sympathetic second-team supporters (like me), and onlookers. Together, we have held our collective breath, crossed our fingers, whispered and shouted our desire and imagined this win. And all of the above have prevailed; truly a quantum entanglement.